We are currently raising caterpillars in our classroom. Our caterpillars arrived in their well packed, well padded box labelled "this side up" looking like small pieces of cut yarn. We no longer have little caterpillars, we have great big caterpillars (but that is not the book that I'm talking about). 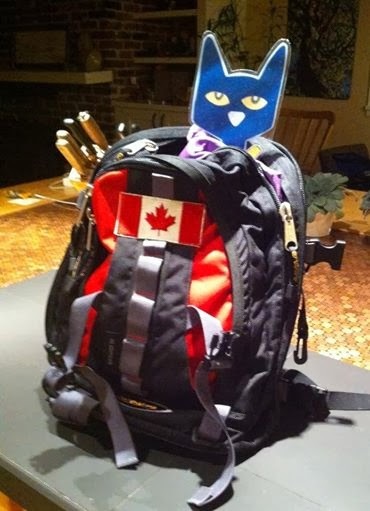 While we are raising caterpillars, I like to read my kidlets a fabulous book that I was first read at a week end camp as a teenager. Stripe (a caterpillar) wants more from life than just eating leaves. 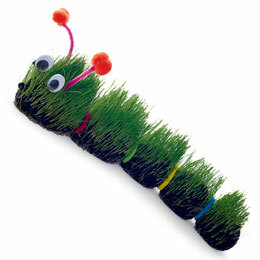 He joins a caterpillar pillar with a lot of other caterpillars all striving to get to the "top". Here he meets Yellow, and together they decide that clambering over others to get to the top is no way to live. But Stripe cannot stay away from the pillar and leaves Yellow who cannot believe that the pillar is what life is about. While Stripe is climbing, Yellow meets another caterpillar who is creating a chrysalis, and encourages her to do the same, saying that she will be a "beautiful butterfly". After becoming a butterfly, Yellow flies to Stripe in the pillar, showing him how to really fly. I like Hope for the Flowers because it speaks on many levels to everyone. 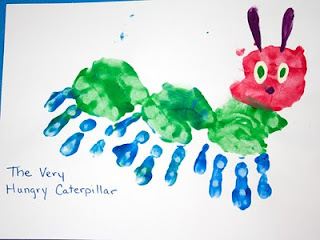 My kindergarten kidlets understood that it is not "nice" to be mean to others to get what you want from the story, as well as the literal story of caterpillar - chrysalis - butterfly. As a teenager, the message that I heard was to be my own butterfly, instead of clambering up someone else's pillar, when I was not even sure what was at the top. A few (initially typed "couple", but the math was not accurate!) 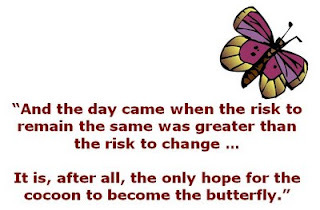 more decades down the road, I am reminded about the courage needed to step into change, holding onto hope/belief that we can "risk for a butterfly". I am also reminded about all the pillars that I climb or want to climb. And that pillar climbing is no way to fly. The story is gently and warmly written with simple, effective and engaging illustrations. 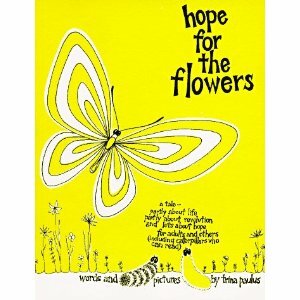 There is a Hope for the Flowers website celebrating the book and the message it carries. There is a musical based on the story, and there are hopes and plans to animate the story. 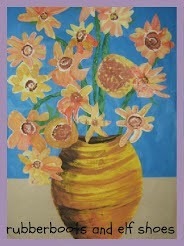 The Porchistas wrote a song based on Hope for the Flowers. A design student created a pop-up summary of the story. The book is beautiful, and I would love to buy it. I preferred watching the clip with the sound off; I found the lively piano did not suit the gentle story. Can you do no wrong? Fabulous book and resources. Have a great weekend my friend. What a lovely book, have never heard of it before, so will now have to search the web for it! Our caterpillars are in their 'cocoons', I hope they can wait to burst out until we are back next Wednesday. Hope your butterfly emerge when you can sit and watch in wonder. I have loved this book since it first came out in the 70s, and I love it still. What an excellent addition to Perfect Picture Book Friday! 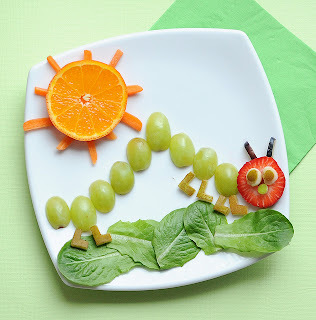 I was delighted by your caterpillar-raising story! Your crafts are great, especially that grape-pillar. 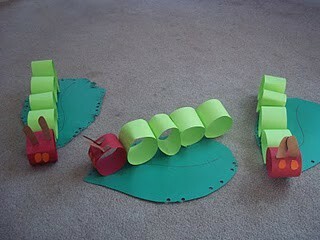 (I was teaching a Vacation School for five-year-olds once many hundred years ago, and we made caterpillars from egg cartons, and painted them. I can still hear in my mind's ear one little girl asking, "That my patta-killa? My patta-killa red!" What a cool book! We raised butterflies a couple of months ago (followed by ladybugs), so we've read quite a few caterpillar/butterfly books, but not this one. Thanks! Great post! I'm off to check out this book ~ it looks so sweet! The pop up book was lovely. (Thanks for the tip about no sound). We'll add this book to our summer list. Thanks. 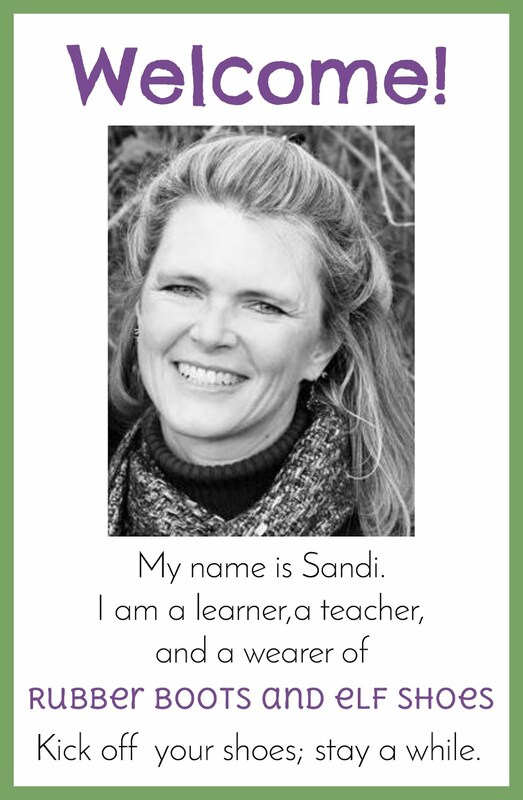 Oh my, Sandi...what an AMAZING array of activities and resources...you definitely deserve a GOLD STAR for it!!! !